Opening reception planned at Phillips Public Library. 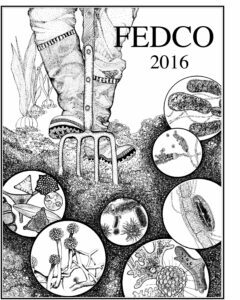 Exhibit of Fedco Seed Catalogs will be on view through May 15 at the Phillips Public Library, 96 Main St, in Phillips. Gene Frey, the catalog’s production manager, will be present to talk about the catalog, which is not only known for its political, social and agricultural commentary, but also its humor and great graphics. “It’s a natural for the library,” said the library’s director Hedy Langdon, noting that in recent years, in addition to loaning books, the library began loaning seeds. The stipulation being that seeds produced by the crops grown would be returned to the library for others to borrow. She adds that the exhibit will be presented in ways that will engage the children of the community, according to a news release from the library. For more information, call Hedy Langdon at 639-2665.